I am sure you have heard the saying: Comparison is the thief of joy. 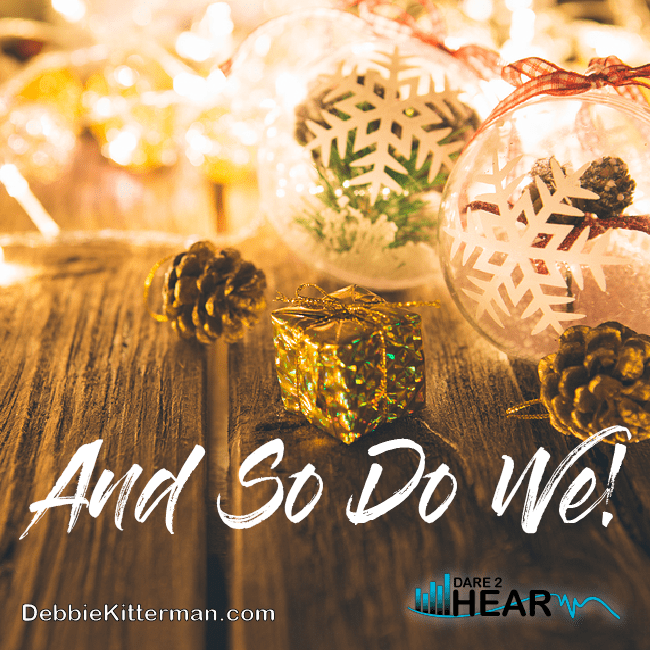 During the Christmas Season, it is easy to slip into the mode of comparison. For each person, this comparison can come in different ways. Maybe it is comparing our decorations to those of our neighbors, our Instagram friends, or even those we see on Pinterest. Maybe it’s comparing the way our kids performed in the Christmas production, who wore the best outfit to the party, or who made the best tasting dish. It’s not just at Christmas time that the “comparison” bug can get us, but at Christmas, it seems to sneak out of nowhere and bite us without being noticed or addressed. I feel as if there is a perfect example in the Christmas Story, of how to deal with this comparisons issue. As we read the Christmas Story, there are details about Mary, Joseph, and Zechariah’s encounters with an angel, but not a lot is mentioned about Elizabeth. In fact, the Scriptures record very little about Elizabeth, but she was a remarkable woman. She believed Gabriel when her husband did not. Because there are only a few verses that relate specifically to her, so much of what we think of Elizabeth is speculative. I think it is safe to say that Elizabeth had some unmet expectations and disappointments in her life, but Scripture shows us that she never gave up faithfully serving God (Luke 1:5-7), or believing (Luke 1:24), and praying for a miracle (Luke 1:13 ). How we handle ourselves in the midst of a miracle matters. There is a lot we can learn from Elizabeth about being faithful, persistent in our prayers, and also in continuing to believe God for miracles. However, I feel like there is another powerful lesson to be learned from Elizabeth that many overlook. It is the way she handled herself in the midst of the most amazing and miraculous time in her life. Elizabeth was at a time in her life, when she could have wanted all the attention, all the limelight, all the focus to be on her. She could have even demanded that it was her turn. Her turn to receive a very important assignment and receive an amazing gift from God; a son, who God had already proclaimed would be special. She could have pointed fingers at those who had scorned her for being barren and said, “In your face!” “See, what’s happening to me now! I’ve been selected, I am special, I’m important.” She could have let pride and comparison come and rob her of the joy God had promised in this season (Luke 1:4). Yet, Elizabeth did none of those things. Instead, she withdrew for 5 months. I believe to nurture the miracle that was growing inside her. I believe she spent time praising and thanking God for His faithfulness. She kept her heart turned toward God and this helped her to operate in grace and humility. Here is where Elizabeth could have begun the comparison and competition game, and gotten upset by the circumstances. After all, in today speak, we would say, Mary totally showed Elizabeth up. This was Elizabeth’s time to have the limelight; getting all the attention and focus, baby showers and celebrations. Yet, here was Mary, she was going to have a baby too, yet she wasn’t married, she hadn’t struggled for years wanting something so bad and not getting it. She hadn’t lived in shame, scorn, and ridicule like Elizabeth. Don’t join the comparison game, it opens the door to disappointment. Elizabeth chose to focus on her assignment from God and bless Mary in hers at the same time. Mary was a young woman and Elizabeth was an old woman, but Mary needed the encouragement that Elizabeth gave her. Elizabeth assured Mary that that all the things that had been told to her, by the angel, would happen. Mary need a safe place to nurture and cultivate the miracle that was happening within her too. They needed the love and support of one another at one of the most profound and hard times in their lives. They needed to champion each other and stick together. They did not need petty jealousy, competition, or comparison going on. Both of these women had a role to play and a powerful God given plan and purpose on their life, and so do we! They needed to stay focused on their own assignment, and stay in their own life lane, and so do we. Each woman had their own set of problems and blessings from the miracles they were to be a part of, and so do we. In order to fulfill what they were called to do, they couldn’t compare, be in competition, or be jealous of each other, and neither can we. 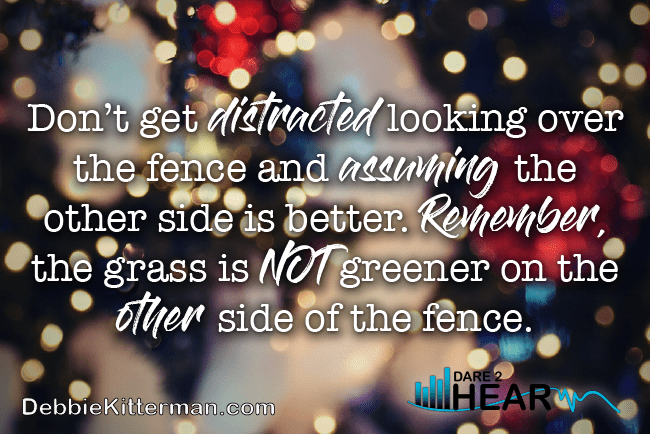 Don’t get distracted looking over the fence and assuming the other side is better. Remember, the grass is NOT greener on the other side of the fence. Don’t get distracted by what others are doing, focus on what you are to do. Instead, they needed to encourage and bless one another, and so do we. Instead, they needed to care for each other and so do we. Instead, they needed to focus on what was right in front of them to do, and so do we. Instead, we need to champion one another, support one another, and be advocates for each other, just like Elizabeth and Mary were. We can advocate for one another, and stay focused on our calling. The Angel tells Zechariah his prayers have been answered, but I believe it was also Elizabeth who was praying this prayer for a child too. I now have an online e-course designed to equip you in understanding that God still speaks today, and He longs to speak directly to you, through His word, and others. He longs to encourage you, strengthen you and comfort you. The training on this site, is fully based on Scripture, and taken from my training manual Releasing God’s heart through Hearing His Voice. My membership site, d2htrainging.com is opened, I invite you to check it out today, and develop a deeper relationship with the Lord, as you learn to hear Him speak to your heart. Good points! It’s amazing how many people think the grass is greener somewhere else, when the simple truth is that the grass is greener where it’s watered! We just need to water our own grass. Thank you Ruth! You are so right, if we just took the time to water our own grass, then ours too would be green and vibrantly growing. Merry Christmas to you. You my friend, are one of the great encouragers, and I appreciate that about you. I pray that your joy is full this Christmas as you reflect on who you are in HIM and realize His pleasure in you. Thank you my sweet friend. I love that you encourage me and I totally receive that Christmas prayer and Blessing! Love and Hugs back to you. Merry Christmas. We can learn so much from these women who lived on the edges — in the transition from the “not yet” to the “already” of God’s promised Messiah. Thank you for your encouragement in this space, and your faithfulness to the call of God upon your life. Debbie, it’s such a sneaky little trap we fall into isn’t it? This is the time of year when discontent easily finds a way into our hearts, and I appreciate this encouragement to “walk away” from the fence. Merry Christmas! Crystal, it is such a sneaky trap, especially this time of year… one that can easily distract and discourage us from the true meaning of it all. Thank you for your words here today, and I am glad I could encourage us all to ‘walk away’ from the fence.. I am walking away from it myself. Merry Christmas to you as well. I’ve never looked at this story in quite this way before. Thanks for sharing your wisdom. Comparison truly is the thief of joy. Rachel, you are most welcome, I hadn’t really considered the story like this before either until recently. I love that God is good at revealing things we don’t always see. Thanks for being here today. And for the amazing perspective on this story! Wow! To you as well! And thank you so much for linking up with us @ Live Life Well. I am so thankful to have such wonderful posts for my readers! This post is a needed reminder for any time of year. That’s so true that Elizabeth could have responded differently, but she selflessly helped Mary instead. That’s a wonderful example for us all. Have a great day, Debbie! Elizabeth definitely showed humility! If I were her age and pregnant, I’m not sure how I would react to anything. ha. Comparison is definitely an ugly trap that can ensnare us anytime we step foot in it. Thanks for the encouragement here to avoid it, Debbie. I do like your take on Elizabeth. I’m working on word studies, but when I go back to Bible women I will rethink her story. Thanks, Debbie and Merry Christmas! Thanks Rebecca, and you are most welcome. I always like when God has me rethinking the things I know, or think… that is just what He did with this story for me. Enjoy your word studies, and let me know what you come up with when you rethink on Elizabeth. Merry Christmas to you as well. Thanks Marilyn, and thank you for all you do as well. Have a great weekend! What an amazing message you just posted. Thanks for it. Wow. Thanks for hosting and have a wonderful weekend. Thanks Patrick. I’m glad it wowed you 🙂 You have a wonderful weekend as well. What a great reminder for this time of year! Thanks for the party! thanks Lisa, My Christmas prep is a tad behind schedule, but it is moving slowly forward. 🙂 I hope yours is going well! Thank you for sharing about Elizabeth and not comparing. My holiday season has taken a twist to quiet and uneventful. I am right where God wants me and I need to keep my focus on Jesus not what I am missing. Oh Maree, I am sorry to hear your holiday season hasn’t played out like you thought, but that it took a twist to the quiet and uneventful.. God knows what we need just when we need it, even if it isn’t what we had planned. I am so glad you are resting in the fact that you are right where He wants you and I know that as your focus in on Jesus, He will minister to you and show you amazing things in this season. Merry Christmas and may many blessings about to you. Such a great Scriptural reminder to keep our hearts right, to be contented with our own life, this season. I love how you brought so many lessons from a few short verses. I love how seemingly small characters can bring us such knowledge! I pray to keep my eyes and heart on Jesus and the path set before me. It is easy to look around at others. I loved this especially “Elizabeth chose to focus on her assignment from God and bless Mary in hers at the same time.” Good Stuff! Thank you for linking up with Live Life Well again this week! We are blessed by your words. Thank you Jessica! And thank you to both you and Amy for choosing to feature this post over at your linkup on Friday. I am beyond blessed by such an honor. I too pray that I keep my eyes and heart on Jesus, but there are times when it is all to easy to look at others and get distracted. Thank you again for your being here and for blessing me with a feature over at your place. I’ve enjoyed your contribution to Literacy Musings. I hope to read more next week.